Dog Boy and Other Harrowing Tales by Erica-Lynn Huberty, a Mysterious Review. Review: Dog Boy and Other Harrowing Tales is a collection of six stories by Erica-Lynn Huberty that don't share a common character, time or place, but instead contributes, as a whole, an uneasy sense of the uncertain or unknown. All the stories are written in first person, but here, too, there is no commonality: some are male, the rest female; some young; others older. And this central character is what really defines each of the tales; they are framed by their environment and circumstances, family and friends, and each provides a foundation for and brings a sense of reality to an otherwise often unusual situation. Though each of the stories is fictional, in an afterward, the author notes that at least five of the six stories are, in fact, based on real events. Though there are supernatural and paranormal elements to some of the stories, none would be considered categorically "horror". They aren't all that suspenseful, either, in a "keep the lights on" sort of way. Rather, each narrative proceeds on a path that has an indefinite outcome. To be sure, a couple of the stories have rather ambiguous, open-ended conclusions. While this may frustrate some readers, this approach is consistent with the overall structure of how the stories are plotted and play out. 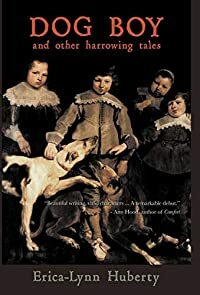 Overall, Dog Boy and Other Harrowing Tales is an interesting collection of well-crafted stories that tends to be more literary than genre (if such a distinction can be drawn) that will likely appeal most to readers who appreciate nuanced, character-driven storylines. Acknowledgment: Erica-Lynn Huberty provided a copy of Dog Boy and Other Harrowing Tales for this review.